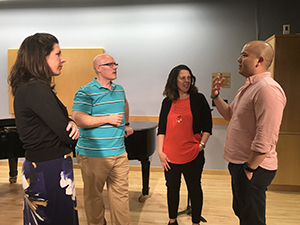 15 early-career voice teachers and collaborative pianists will gather for an intensive training experience at New England Conservatory of Music, June 3-13, 2019. Applications for the 2020 NATS Intern Program will be available in late summer 2019. 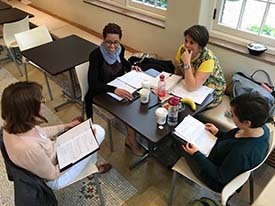 The NATS Intern Program is an exceptional training experience that seeks to pair expert and recognized master teachers with talented early career members of NATS. Within an intensive format designed to promote the dynamic exchange of ideas and techniques, the goal is to improve substantially the studio teaching skills of voice interns and the coaching skills of collaborative piano interns. Voice interns teach four lessons each to two students (preferably one male and one female) and participate in master classes and coaching under the supervision of master teachers. Collaborative piano interns accompany lessons, master classes, and other sessions as appropriate, and coach voice interns under the supervision of the collaborative piano master teacher. In addition, the master teachers, a vocal literature liaison, and selected guests present special lectures and demonstrations. 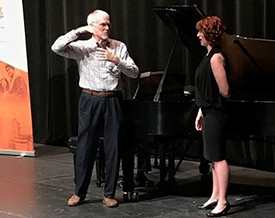 The voice master teachers typically include collegiate and independent studio teachers who specialize in 'classical' singing, in 'non-classical' styles, and who have experience in the needs of the private studio. Interns are normally assigned to work with a master teacher in the area of the Interns' area of specialization. Independent studio teachers are strongly urged to apply. NATS and the NATS Foundation provide tuition, housing, and meals. Interns are responsible for their travel expenses, though they may request financial assistance from their NATS chapters or regions as well as from their institutions of employment. 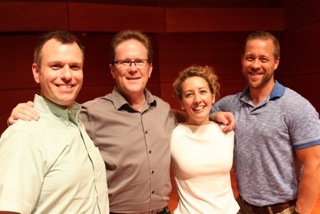 Pictured: NATS 2016 Interns (from left) Aaron Humble, Master Teacher James Doing, Jamie-Rose Guarrine, and Derek Chester. I've often heard that the Intern Program is the best thing that NATS offers, and I couldn't agree more. The ripple effect of this Program is endless. Every Intern will forever be a better teacher and their students will be better teachers because of it. I'm so grateful for the experience and for the lifelong bonds that were formed during those formative weeks together. I feel that the Intern Program not only enriched my teaching, but also was a forum to nurture my own performance practice and technique. I left the Program feeling incredibly inspired by both the master teachers and my fellow Interns, who I now consider not only colleagues but dear friends. 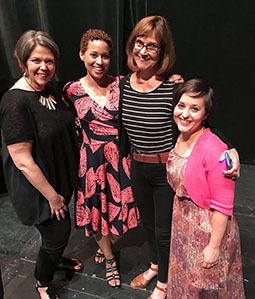 I have so many new strategies to apply to my own teaching, and left the Program with so much information on voice science, pedagogy, repertoire, and contemporary commercial vocal performance. I'm so excited to apply my new knowledge in my studio. for details and facility requirements. If you are interested in contributing to the support of the Summer Intern program, donations may be made to the James McKinney Memorial Fund through the NATS Foundation.